In Part 6A of Theme Park University’s extensive series on Hard Rock Park, we looked at storytelling details that made Hard Rock Park a theme park, versus just an amusement park. From a wall that guests were encouraged to cover with graffiti to bathroom fixtures designed to get people talking, Jon Binkowski dared to be unconventional in his design. You could say that Jon is a little eccentric in his thinking, but in reality rock n roll has always been about pushing the boundaries of music and he wanted his park to step outside the box a bit too. Let’s pick up where we left off, inside of Alice’s Restaurant. We were sitting at Arlo’s table, which featured a lazy susan that doubled as one of the most unique art pieces in the park. The restaurant was named for Arlo Guthrie’s original eighteen-and-a-half minute song, in which he recounts a comically exaggerated Thanksgiving adventure he had while working for restaurant owner Alice M Brock. On November 25, 1965, the 18-year-old Guthrie and his friend Richard Robbins, 19, were arrested for illegally dumping some of Alice’s garbage after discovering that the city dump was closed for the holiday. Two days later they pleaded guilty in court before a blind judge, James E. Hannon. The song describes -to humorous effect- the arresting officer’s frustration at the judge’s inability to see the “27 8-by-10 color glossy pictures with the circles and arrows and a paragraph on the back of each one explaining what each one was to be used as evidence against us.” In the end, Guthrie and Robbins were fined $50 and told to pick up their garbage. 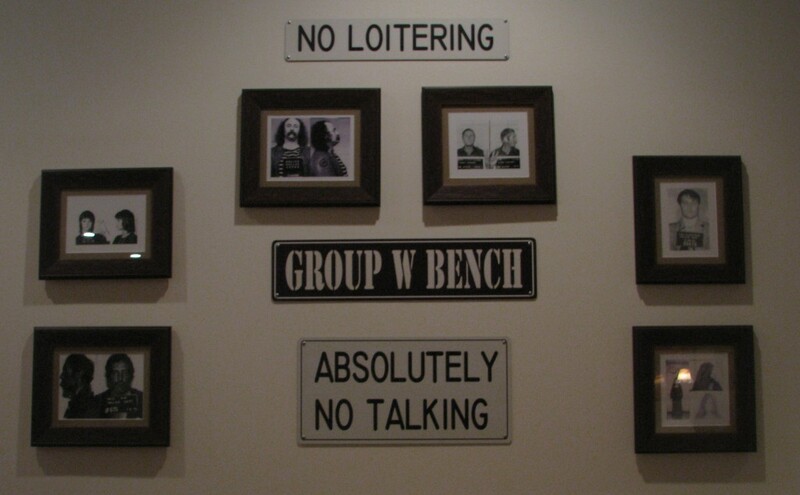 It was only fitting that Alice’s Restaurant featured a wall of rock N roll legends who also had run-ins with the law. Their mugshots hung on a wall just across from Arlo’s table. Hard Rock Park, much like the cafes, was chock-full of exclusive memorabilia in virtually every attraction, gift shop and restaurant. Most of the objects were on loan from Hard Rock International. Hundreds of guitars, concert posters, costumes and drumsticks were on display – each with their own fascinating back story. If you were a music history buff, forget the attractions or entertainment. You could spend an entire day just admiring the history that blanketed every single building. 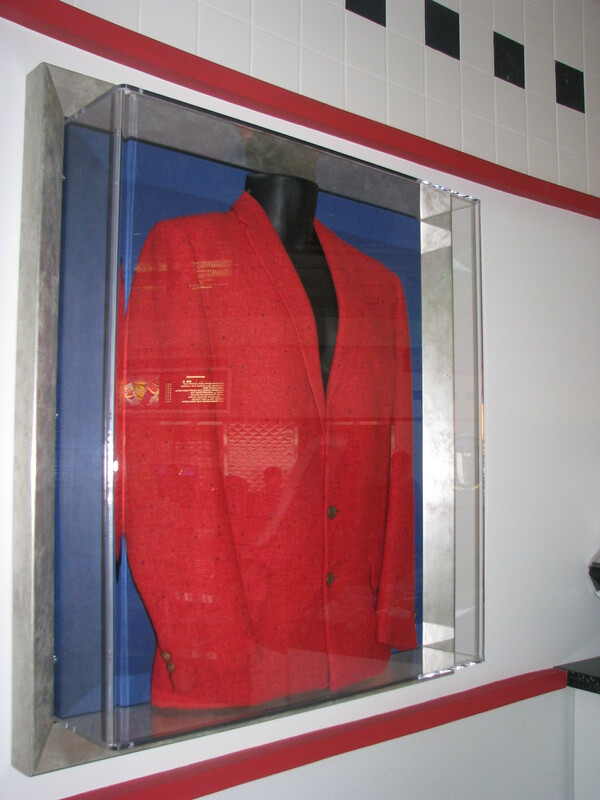 This red tweed jacket was the actual one worn by Buddy Holly during many concerts throughout most of his career. The piece was showcased in the Great Meals Diner – a 50’s restaurant that featured classic American fare, employees on roller skates and on occasion, a doo-wop group belting out classic hits from days gone by. Admittedly, I have lavished quite a bit of praise on Hard Rock Park, but it wasn’t perfect – far from it. Take, for example, this gorgeous marquee outside of the Great Meals Diner. Nearly every time I walked past the place, its neon sign would short out. As far as I know, the problem was never fixed. Signage all over the park was extremely bold -even edgy- for a theme park that catered to a family audience. Steven Goodwin, responsible for securing investors for the park and originally from England, always wanted to have a fish and chips shop. 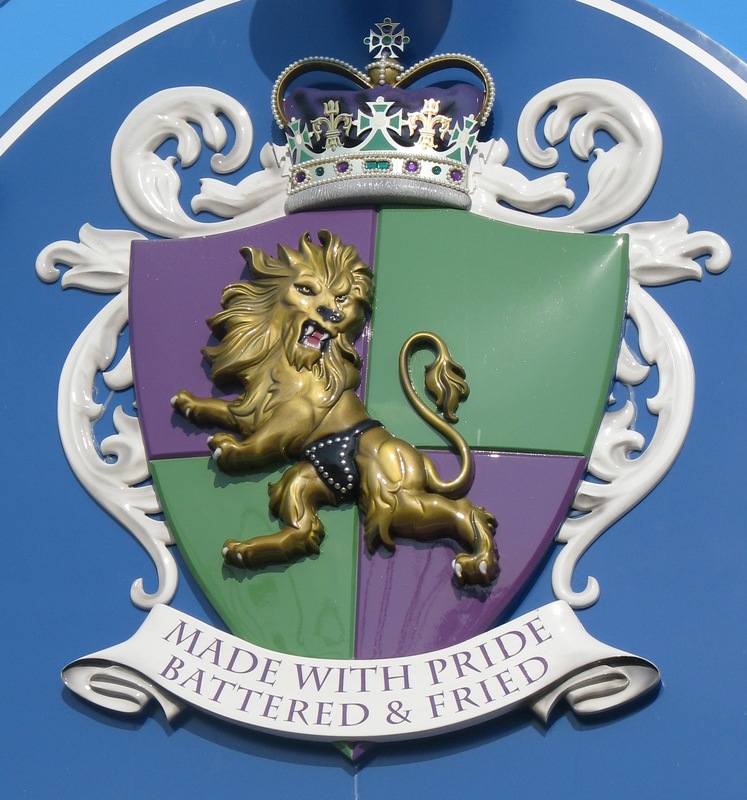 Here he helped build one that could make his mother proud – The Cod Piece Fish and Chips shop located in British Invasion. 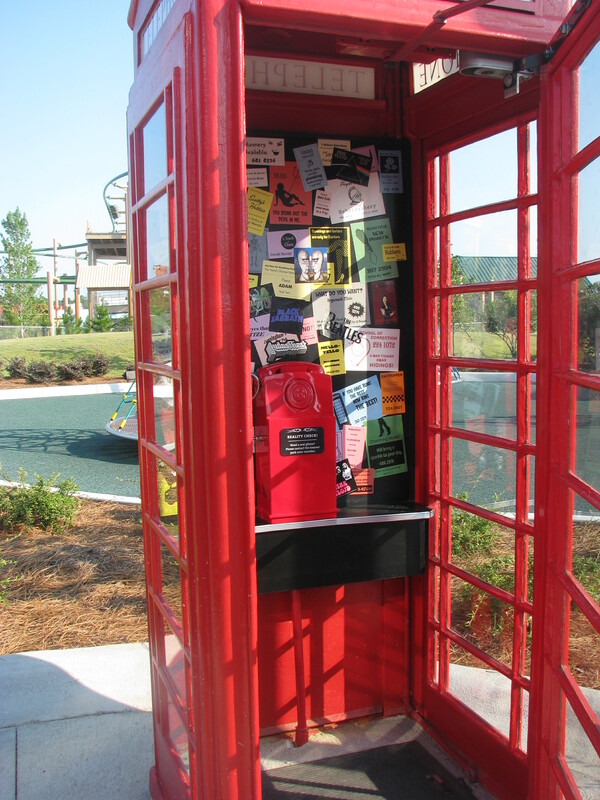 Just a few steps away from the chip shop, also in British Invasion, was a traditional English-style phone booth. It was more than just the photo opportunity most guests expected, though. Much to the surprise of the unsuspecting tourists, a pressure-sensitive mat under the floor would cause the phone to ring whenever someone stepped inside. If you were bold enough to answer the call, you could hear various pre-recorded conversations such as dialogue between a rock star and a record producer. The real stars of the booth, however, were notices left by aspiring artists and fictional business cards that might have fit right in during the 1960’s in Britain. Around the corner from the phone booth – just outside the entrance of Nights in White Satin The Trip– an unusual guitar seemed to have wedged itself perfectly into a giant stone. 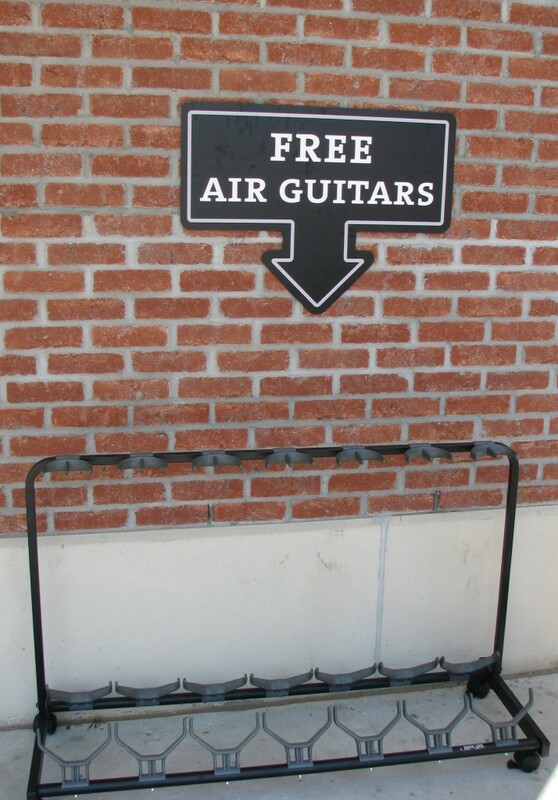 Several times a day, a ceremony would be held to find the true King (or Queen) of Rock. All you had to do to secure the regal title was pry the instrument from the boulder. You may have seen this kind of show in another theme park before, but Merlin never had a cloak this cool. 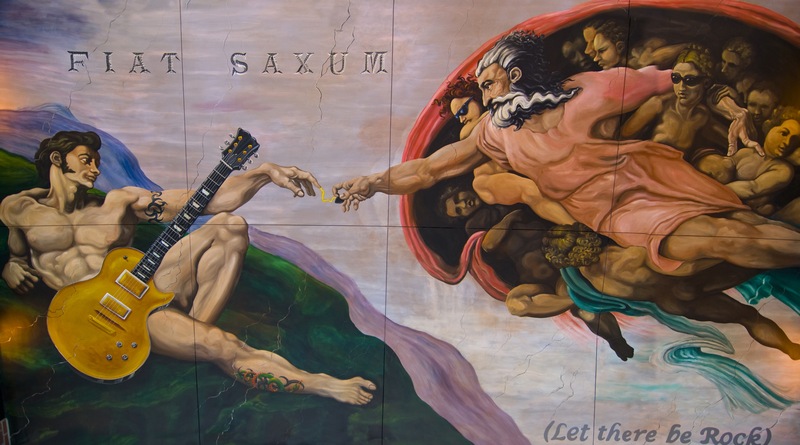 While beautiful from a technical standpoint, a spoof of Michelangelo’s famous painting on the ceiling of the Sistine Chapel in Rome didn’t go over well with the local audience. Hard Rock Park was located in Myrtle Beach – smack dab in the middle of the Bible belt. Many visitors considered the mural to be blasphemous, which led to it being a huge cause for complaints during the park’s run. Surprisingly, many park guests were upset by a well-executed tribute to a famous work of art, while a visual pun whose translation could be seen as actual profanity was displayed all over the park and went largely unnoticed by patrons. 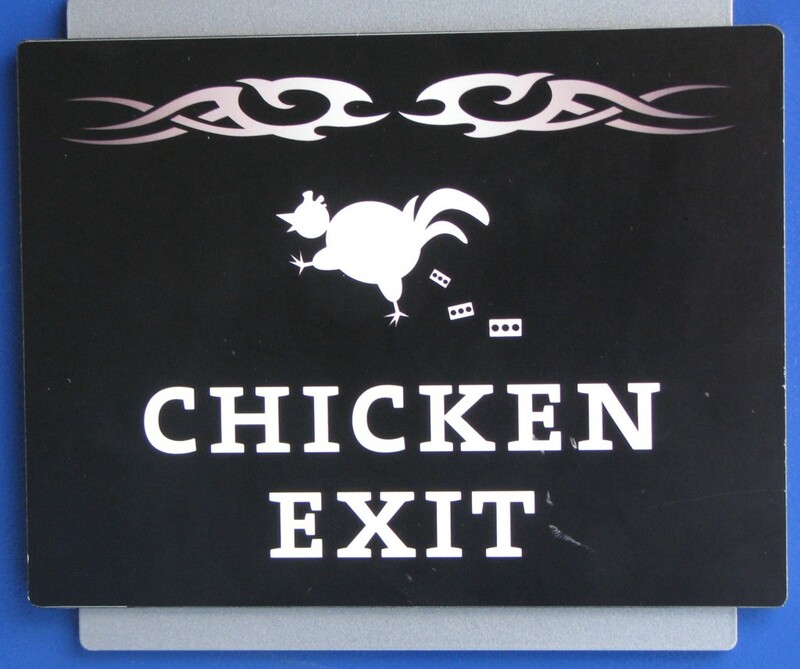 My personal favorite detail, possibly in any theme park in the world, was the sign posted to tell guests where to go if they were too afraid to ride an attraction: a silhouette of a chicken shitting bricks! Rock n roll is a genre that isn’t known for pulling any punches and Hard Rock Park didn’t either. Jon Binkowski dared to be different – not because he was crazy- because these details were what the brand required for an authentic experience. If you are building a park about princesses and fairy tales you have to play it safe, but in order to stay true to rock music, squeaky clean won’t cut it. Next time, Theme Park University will take an exclusive look at some of the attractions and concepts that didn’t quite make it into Hard Rock Park during the summer of 2008, as well as some additions that, had history unfolded differently, would have kept the park fresh well into this decade. Meanwhile, let me know what you think about these details in the comment section. Did they push the envelope too far, or not enough? This entry was posted in Extinct Attractions, Hard Rock Park and tagged Alice's Restaurant, Arlo Guthrie, Buddy Holly, details, Great Meals Diner, Hard Rock Park, Jon Binkowski, theme park, theme park details. Bookmark the permalink. Trackbacks are closed, but you can post a comment. I was into roller coasters and theme parks when Hard Rock opened- I remember the group on rrc going all crazy over the park, and being confused when it fizzled. The details that you’ve shown over this series makes me actively sad I didn’t pay more attention then, and that I’ll never get to experience them in person. There was a lot of love applied to this, and the details bear witness to that. I would’ve loved to ride Nights in White Satin. It makes me so sad that not only did they not keep the themeing, but painted over all the cool things before closing. Thank you so much for these articles! I never made it to Hard Rock or Freestyle but find it’s story fascinating, it looked like a one of a kind place. One thing: The “shorting out” neon sign seems intentional! 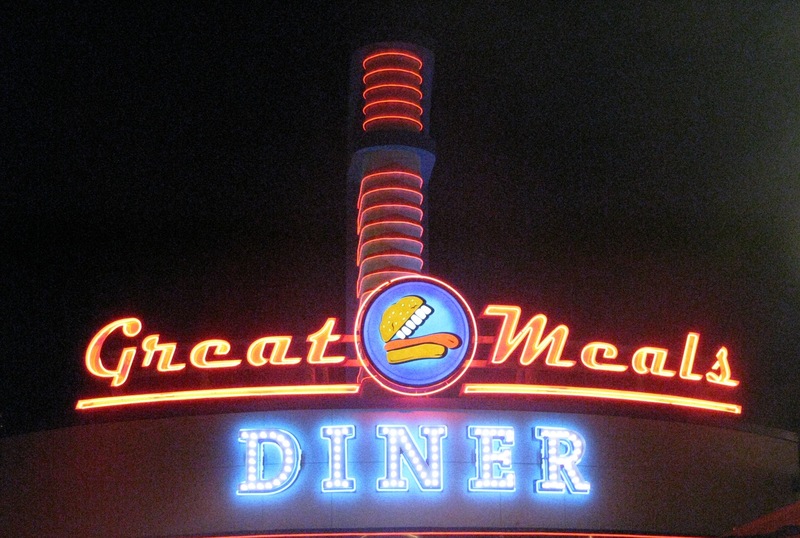 At first I thought the way you had written about the neon sign of “Great Meals” was a joke, but I couldn’t detect any irony in your wording, and I think you might have missed out on the joke! The sign shorts out so that it says “Eat Me”, complete with an open mouth between the two words. Another rude but clever joke! Again, sorry if you were fully aware of this, but the way you wrote about it as a “mistake” on part of the park seems like you didn’t quite notice the joke! Cheers! Thank you so much for these articles! I never made it to Hard Rock or Freestyle but find its story fascinating, it looked like a one of a kind place. 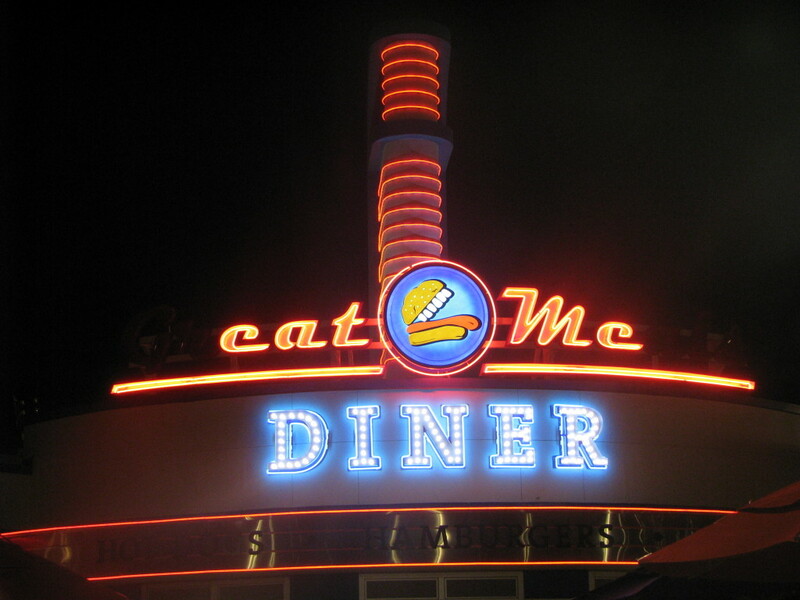 Maybe I didn’t “wink” enough, but yes… I knew the diner sign shorted out intentionally. I even still have a “grEAT MEals” t-shirt I bought from the park years ago!